1969 Beatles “Abbey Road” billboard. All photos by Robert Landau. Here at Levitt Pavilions, we celebrate the “place” in creative placemaking. Places give a city its character and its inhabitants points of pride, which is why we’re so excited to learn more about the history of a place just outside our Los Angeles office digs: the Sunset Strip. In a new exhibition at the Skirball Cultural Center (on view through August 16, 2015), Los Angeles-based photographer, Robert Landau (b. 1953) artfully captures the spirit of L.A.’s iconic Sunset Strip in the 1970’s-80’s—a place that was home to the industry’s biggest record companies, night clubs and rock star-filled hotels. 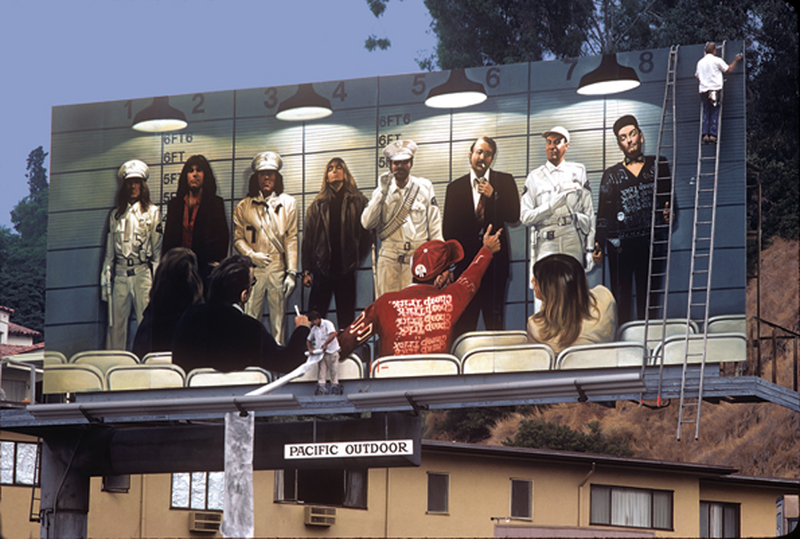 Painters installing a Cheap Trick billboard in 1979. Armed with a camera and an eye for quirky compositions, then 16-year old Landau used to wander down the Sunset Strip, just blocks from his house, and document his surroundings. He recalls seeing installation crews bringing billboards to life in the early mornings, meticulously hand-painting rock ‘n’ roll icons onto wooden panel billboards. Many of his photographs playfully capture those surreal early-morning moments when larger than life images of rock music legends, like the Beatles, Bruce Springsteen and Pink Floyd, towered over installation crews. Early on, the billboards caught Landau’s eye because they illustrated some of the biggest names and faces in the music business, and he wanted to share them with friends who lived in other parts of the city. Landau explained that these artful billboards—which took so much meticulous effort to create—had a lifespan of about 30 days, creating a sense of urgency in Landau to document them before they were whitewashed to make way for another billboard, disappearing forever. Over time, Landau grew increasingly captivated by the visual elements in the billboards; designs that were often based upon the original album cover design. Landau recalls being impressed that “so much thought and energy went into creating [those] album covers.” Often without copy, the images were strong enough to speak for themselves. 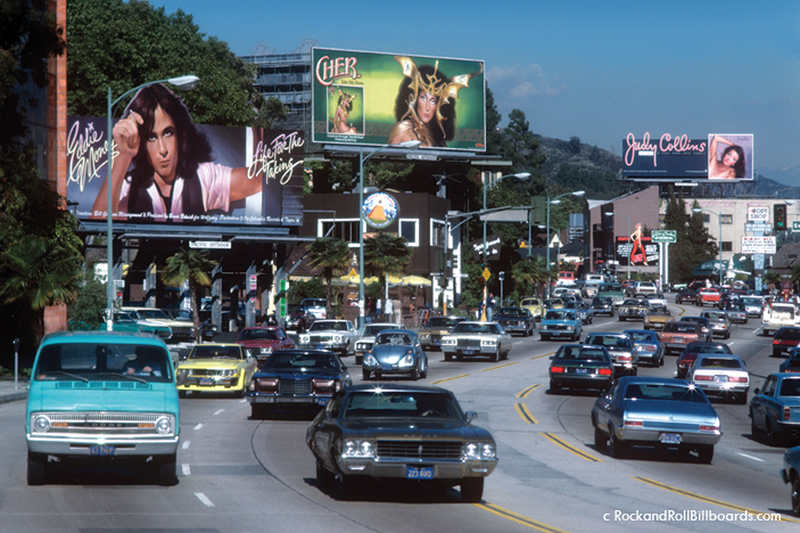 The Sunset Strip in 1979, with hand-painted billboards featuring Eddie Money, Cher and Judy Collins. At the time, little did Landau know that his photos were immortalizing ephemeral pieces of art, creating the largest archive of Sunset’s hand-painted billboards and capturing the spirit of an iconic place at its prime for future generations to enjoy. In putting together his book, Rock ‘n’ Roll Billboards of the Sunset Strip—the impetus for his traveling exhibition that’s now on view at the Skirball Cultural Center—Landau realized that there was an important story to be told, one that people in other parts of the country—and other parts of the city—never knew existed. 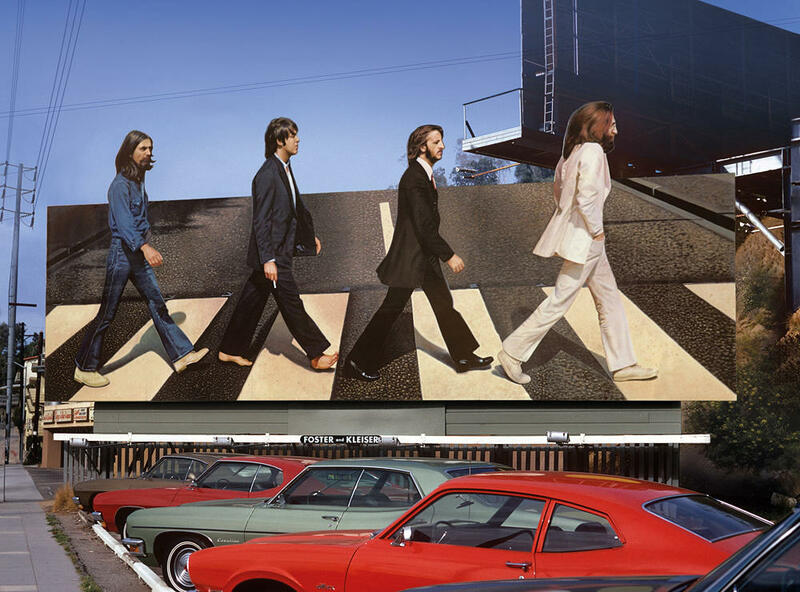 (Left) 1969 Beatles “Abbey Road” billboard after Paul McCartney’s head was stolen by then teenager, Robert Quinn; (Right) recent photo of Quinn with Paul McCartney’s missing head. 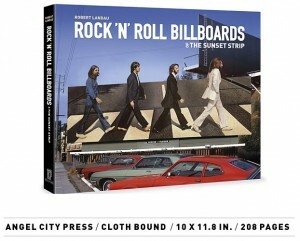 His images tell stories of the fleeting moments that shaped the Sunset Strip’s iconic identity, like Paul McCartney’s head being cut off of the Beatle’s “Abbey Road” billboard bringing momentum to the rumors that McCartney had died (later tracked down by Landau), or the story of Bruce Springsteen defacing his own billboard because he did not approve of the way he was depicted. 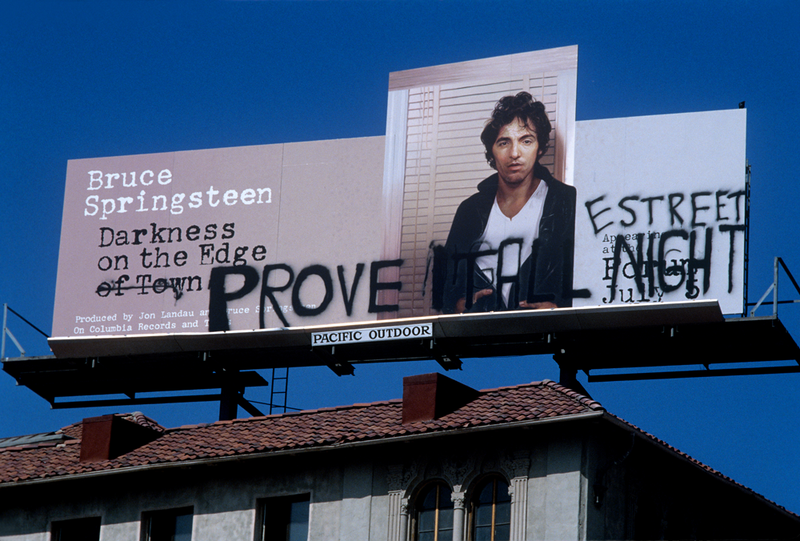 1978 Bruce Springsteen billboard, defaced by “the Boss” himself. While the focal points of Landau’s images are the hand-painted billboards themselves, each photo speaks to the people who energized the Sunset Strip just as much as those larger than life works of art. So are we, Mr. Landau. Angelenos, don’t miss your chance to hear more about Landau’s work from Landau himself in a free talk taking place tonight at the Skirball Cultural Center. Landau and professional billboard painter, Enrique Vidal, will delve into their fascination with the art of the rock ‘n’ roll billboards, discussing their respective careers as well as the exhibition. This entry was posted in Beyond Levitt and tagged Bruce Springsteen, Donna Summer, ELO, Jimi Hendrix, John Lennon, Pink Floyd, Robert Landau, Rock 'n' Roll Billboards of the Sunset Strip, Skirball Cultural Center, The Beatles, The Rolling Stones, UFO on April 21, 2015 by Nicole McGaffey.